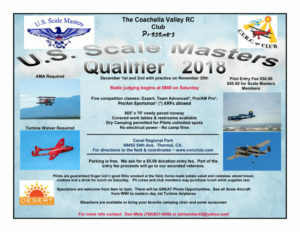 Scale Masters Qualifier-Coachella-Dec 1-2 – The Friendliest way to fly RC scale competition there is! From Sportsman class flying an ARF to Masters class flying your latest masterpiece, this is an event every scale modeler in So CAL can truly enjoy. Come on out if you can!